I don't often feel like I've been flung into a scene from the Hunger Games, which is fortunate since my skills with a crossbow aren't up to snuff, but several weekends ago I found myself racing along rugged terrain with little on my mind except survival. You see, my husband, Joel, is training for a marathon, and he decided to shake up his typical weekend training by entering a half marathon trail run. Being inclusive, he also signed me up to run the 10K version, which immediately prompted me to google "10K distance" and then to grapple with the disparity between its length (6.2 miles) and my fitness level, which I was generously capping at 4 to 5 miles. If one can be simultaneously concerned, charmed, and baffled by the arbitrary nature of distance, I was. My confidence wavered: Is it even legal to have a 10K race that's a half mile longer than 10 kilometers? (Don't let that decimal point fool you into thinking that what follows doesn't matter.) My love of precise wording bristled: How is an EXACT distance APPROXIMATELY measured? Then I settled on one final thought: This is going to be quite an adventure. And that was an accurate sentiment. After the pre-race safety meeting, during which the organizer encouraged us (twice) to wait for help and avoid panic if we ended up in a ditch, we lined up and waited for the gun to sound. The first 1.5 miles ascended a steep gravel incline along the scenic Pennsylvania mountainside -- a morning wake-up call to be aware of your cardiovascular system -- and then we were directed onto the trail itself. Somewhere in the deep recesses of my mind, I envision a "trail" to be a gently rolling dirt path, one nicely situated in a peaceful bucolic setting, perhaps next to a babbling brook or a pleasant grove of shade trees. This wasn't that type of trail. This trail was a rocky, muddy, root-strewn, leaf-covered path marked by small flags to keep runners on track as we plunged down sharp hills and climbed steep inclines. I jumped over crevices, climbed rocks, and raced across occasional chicken-wire covered planks that were propped over streams. I fell, got back up, kept running, got disoriented, fell again, shook it off, and just kept running. For an hour my thoughts were grounded solely in the present; I only could think far enough ahead to where I should place my next step. Tree branches, rocks, ditches, and sharp turns appeared immediately in front of me and forced to absorb and assess my surroundings as quickly as possible, something both chaotic, invigorating, and surprisingly peaceful. You know you might multi-task too much if a frenetically-paced trail run brings you to a place of deep inner calm. Unlike road running, I had no idea how far I had traveled or how fast I was moving. I simply ran. I ran until I was alone on the trail, unconcerned with where I was in the pack, just conscious of each step, until I crossed the finish line and looked for Joel. We were both a muddy mess, and we accepted the complimentary Gatorades and ate our complimentary lunches off of Styrofoam take-out containers as we sat in the grass, stretched, hashed out our experiences (I lost my sunglasses at some point.... You fell too, didn't you? ), and waited for the results where I was pleasantly surprised to find that I represented the decade of women in their 30's well. Apparently, back woods trail races of questionable distances where you just might end up in a ditch must suit my running style. I should add that Joel also was a medalist in the men's division, which didn't surprise me. The difference between us lies in the fact that he's continued his training, whereas when I crossed the finish line I stopped exercising entirely and have replaced those efforts with an attempt to eat my body weight in leftover Halloween candy. 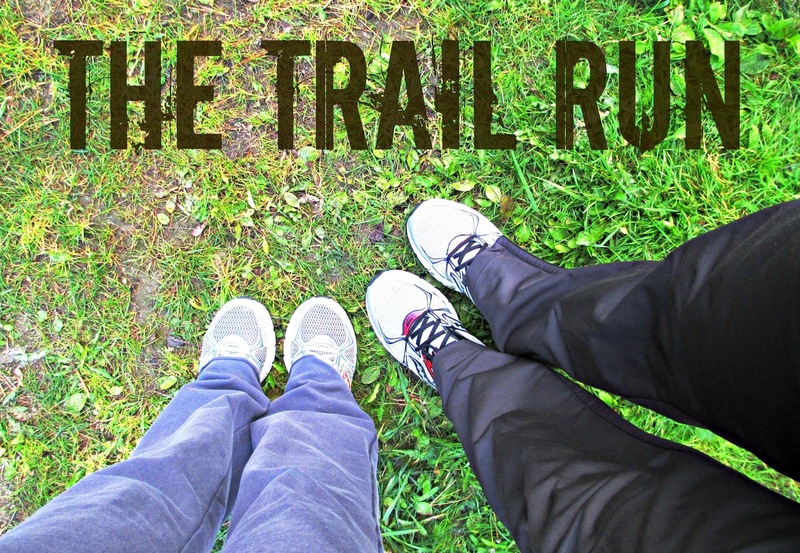 And there you have it, my friends: the exact approximate true story of the trail run. You are awesome. And crazy. Fortunately for you, that's one of my favorite combinations. Good for you for sticking with the gym, Lisa! Way to go! !